The orb menus will fly in from random directions.Fly back off screen once clicked. Note: If the orb menus open onscreen when you load this theme, just click each orb to dismiss. After that it will work fine. This will hopefully be fixed in the future. Works on Windows 7, 8.1, and 10. Wow!!! Fantastic looking DX Jim! Very nice Jim, I love it! DesktopX is no longer available. Those who still have it can still use it, and it works on 10, because I use and build all my desktopx themes on 10. Thanks, Don, Tom and skibadee! Been a while since I did DX. skibadee, you can download the theme, but unless you have DesktopX, you can't use it. 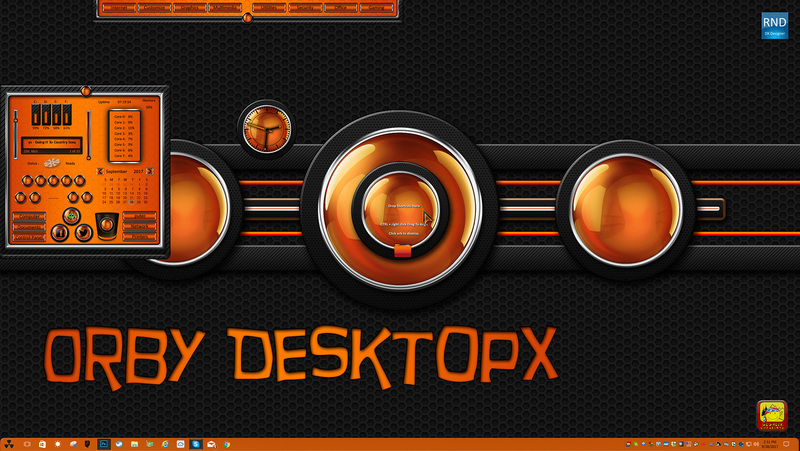 The only DesktopX that works on 10 is the beta that Stardock never released. It is no longer available. Thanks Dave! Love ya, man.